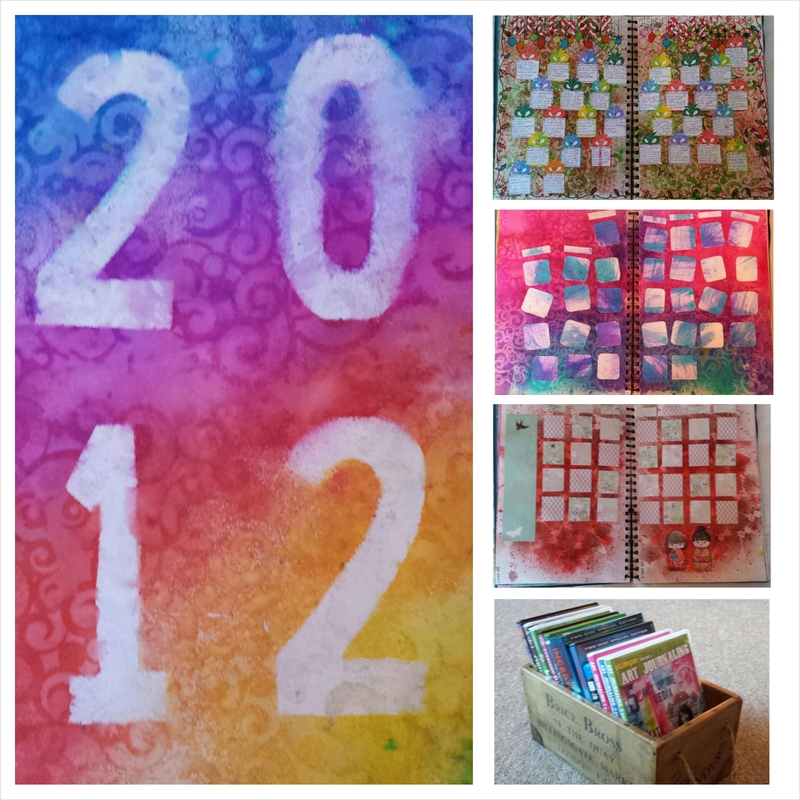 365 Calendar 2012 finished (well almost)!! 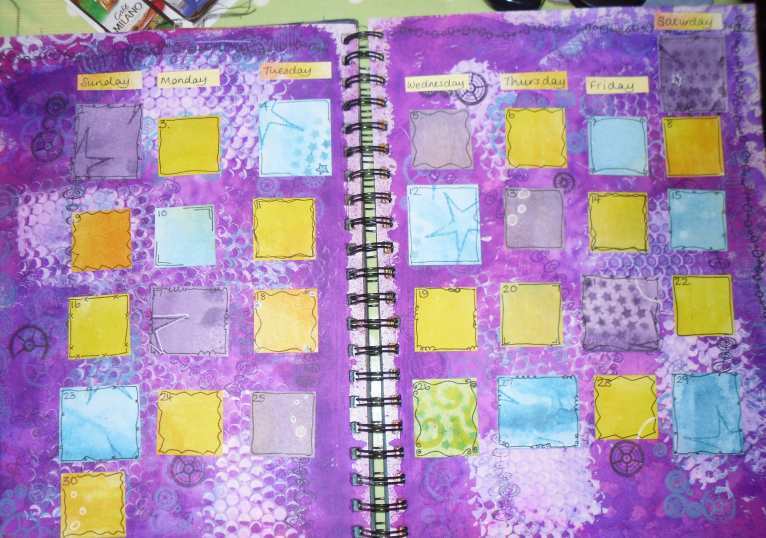 It’s 31 December 2012 at 22:42hrs and you could say I’m cutting it fine but I did finish my calendar pages in 2012 – just about. 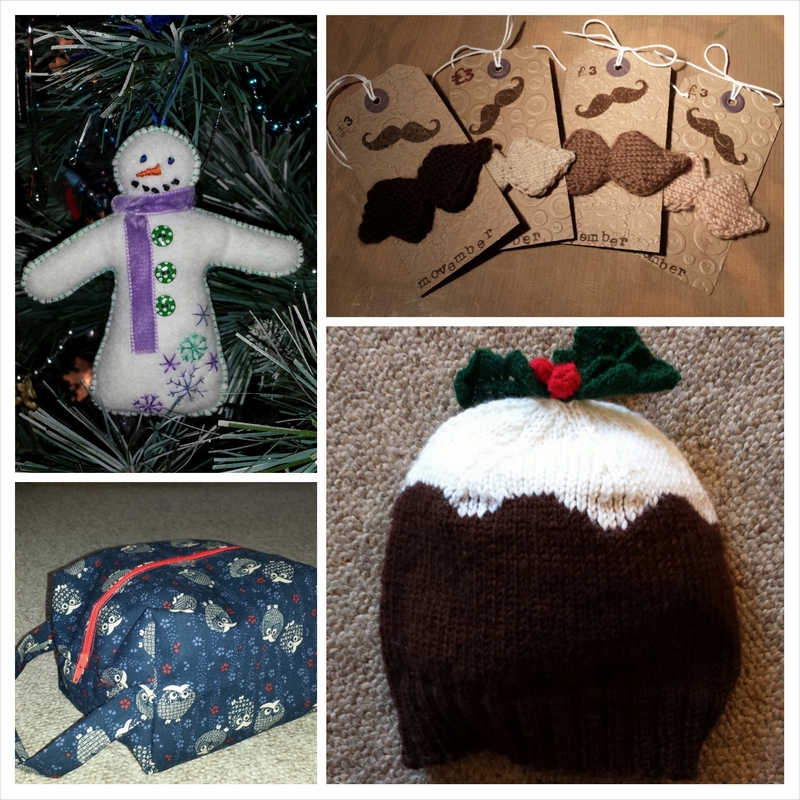 I created November and December’s pages on 24/25/26 December so it was only just in time. Sorry the photos are not great quality I don’t have much luck with cameras. I was going to do a ‘Movember’ themed page but it just didn’t happen and I just used a rainbow of Dylusions inks with a dragon fly stamp by Squiggly Inks. 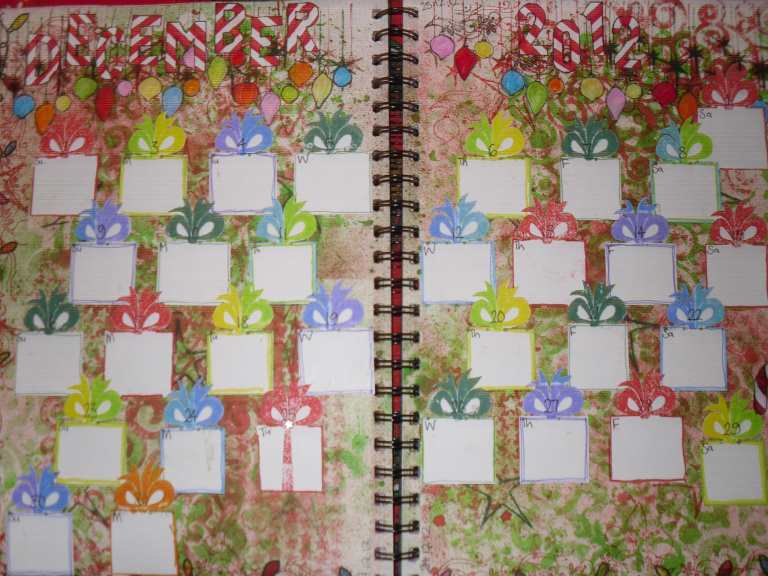 December had a little more thought put into it, I used Dylusions inks for the background and some freebie stamps from Craftstamper. Then I drew fairy lights around the edge and coloured in the baubles with some promarkers that I got for Christmas. 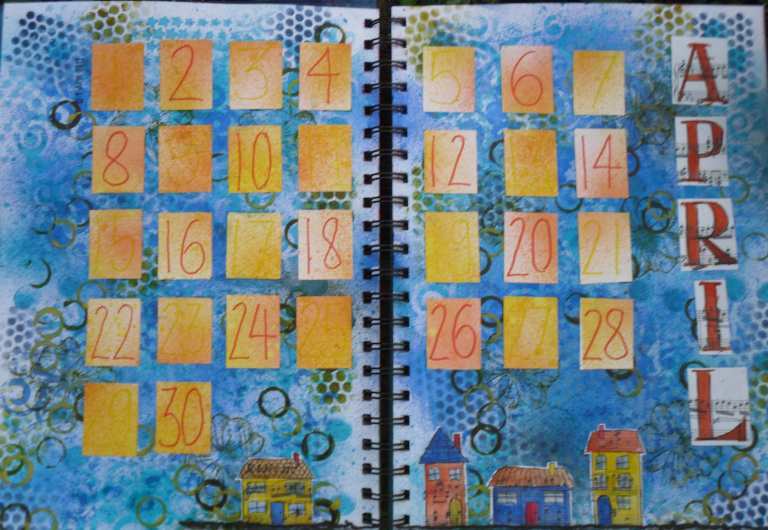 The day squares were a parcel stamp that I used just the bow on in a rainbow of inks. I drew the letters for the month and coloured them in like candy canes and in ‘real life’ it doesn’t look quite as manic as it does in this picture. I really hope I can keep up with this challenge in 2013 as I have really enjoyed doing it. I am determined not to let work get in the way which has been my main issue in the latter part of 2012. Right now time to go and see the new year in! Happy New Year everyone!!! 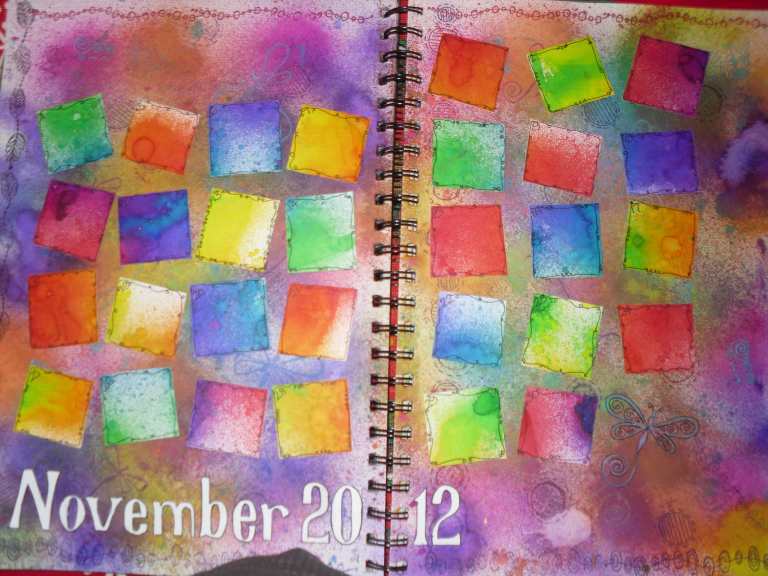 This is my October Calendar Page which wasn’t completed until November! I wanted it to be autumnal as I love the colours of the leaves and Orange is my favourite colour in October. It came out quite well although I did want to do some drawings of squashes and pumpkins for the bottom right corner which haven’t happened yet. The veggies are on top of my TV looking pretty but I haven’t drawn them yet!! 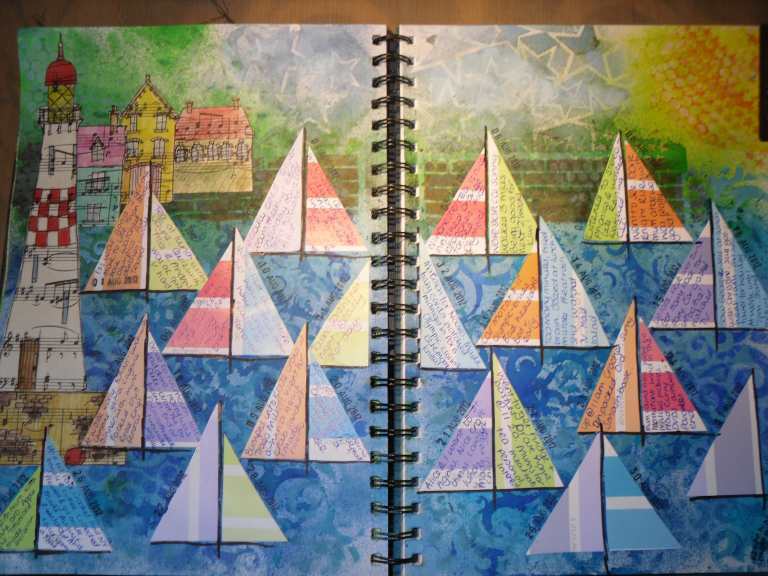 The background is dylusions inks with Tim Holtz papillion stamped over the top. 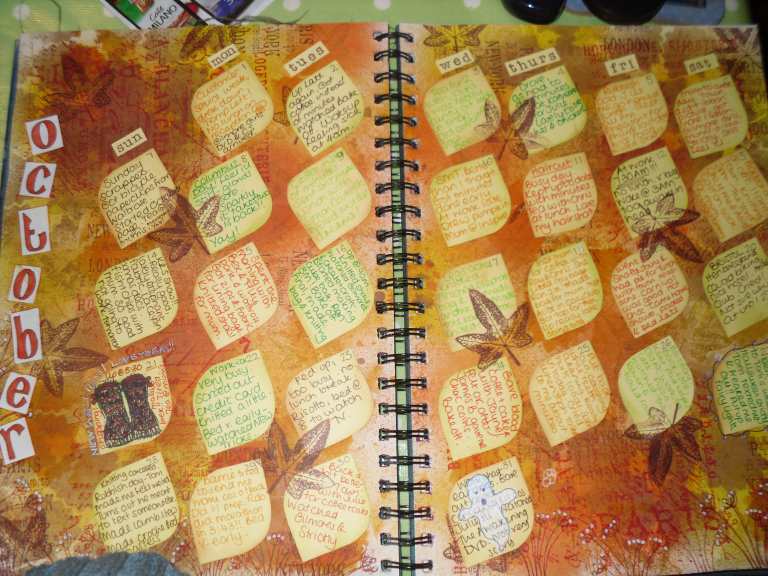 I then used two free craft stamper stamps to put leaves and a border of grasses on and then I wrote on the leaf days with autumn leaf coloured pens. This is a close up of the 31st with it’s translucent Ghost!! If you look at Sunday 21st October I have stamped some dylusions wellies on it as I bought the most fantastic pair of red/black spotty wellies in Bristol with bows on!! I love them and keep wishing it would rain a bit more so I can wear them. This is my September page – it’s not finished and I don’t like it much. But to be honest I didn’t really enjoy September so it’s probably quite fitting. 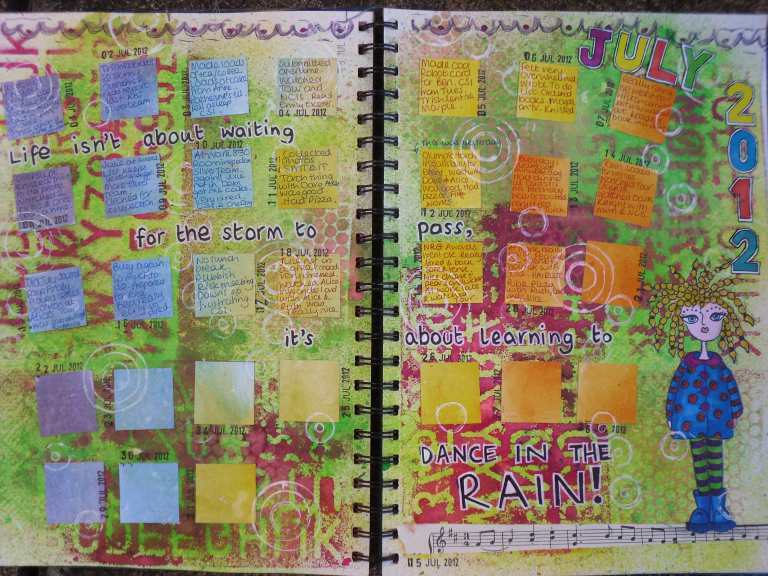 I have written my normal diary so I can fill it in retrospectively but I am quite disappointed with my progress. It was rushed and I made the date squares with left over pieces of card. I now need to do November pretty sharpish as it’s the 17th already! I might even try to start December at the same time. Finally my July Calendar page! This is the latest I’ve been so far. But at least it’s still July. Close up of Ruby Rainbow stamp by Dylusions and my writing in white marker. 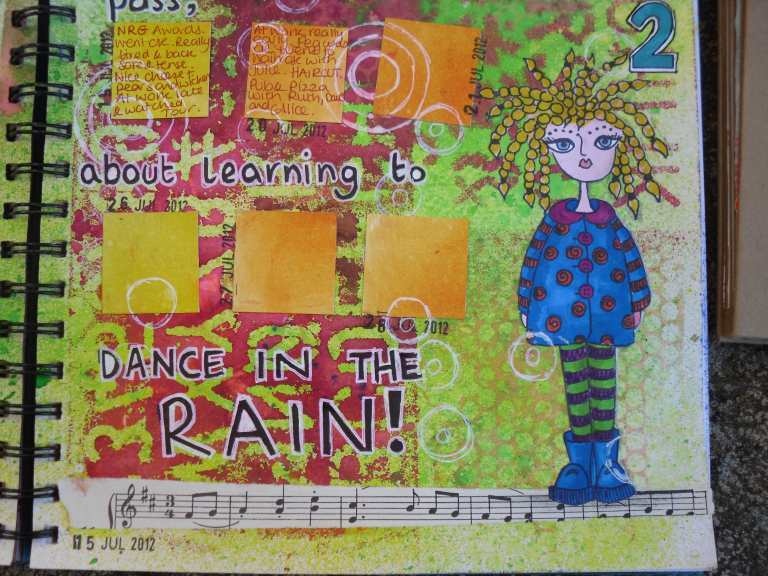 The quote reads “Life isn’t about waiting for the storm to pass, it’s about learning to Dance in the rain! 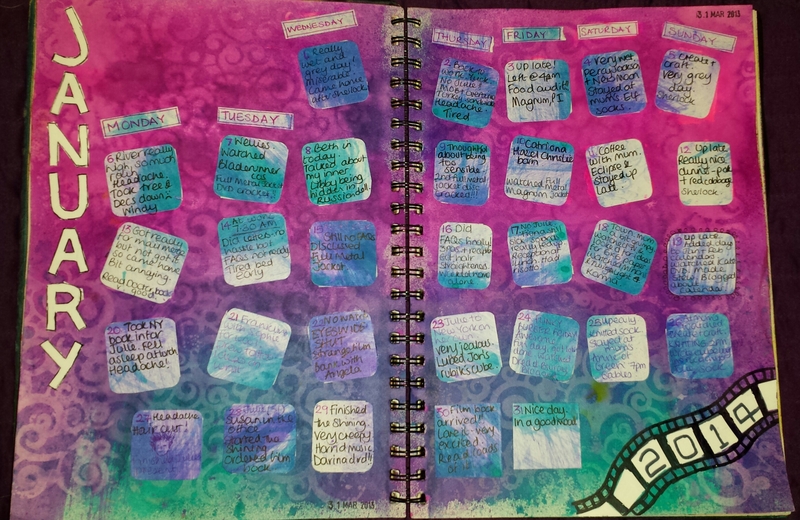 !” I wanted to comment on the rubbish weather we’ve been having in the UK this summer but I also wanted to reflect how I need to remember to look on the positive because work has been so rubbish as well That’s also why I made it a really rainbow page to counteract the gloomy weather. And now the Sun is shining!!! 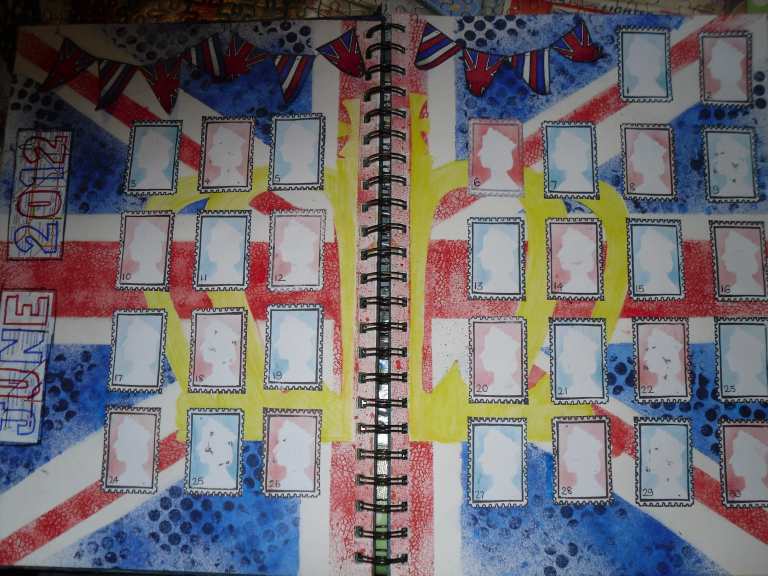 This is my June page for the 365 Calendar Challenge I had to do a Queen’s Diamond Jubilee themed page because it would be rude not to! Also, my birthday is on 6th so when I was 2 the Silver Jubilee fell on my actually birthday. We had a street party and part of the red, white and blue cake was decorated pink just for me!! 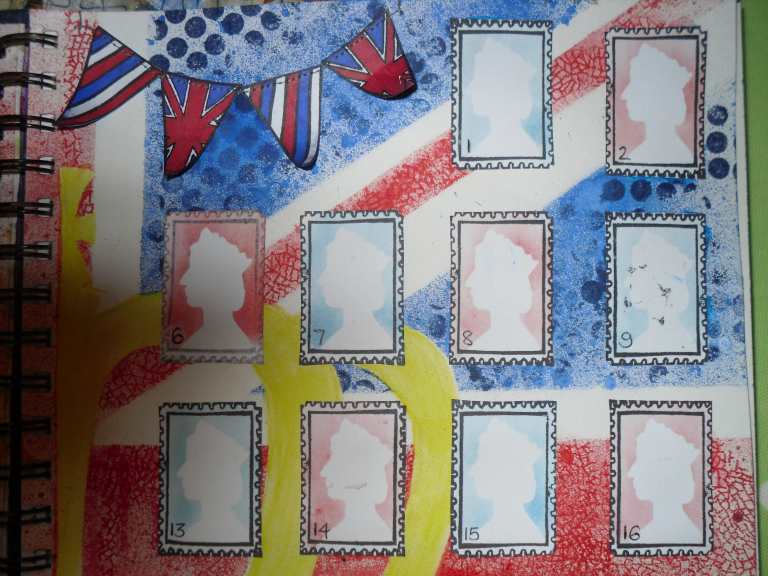 I tried to make my 6th June stamp pink in memory but it doesn’t really show up in the photos. 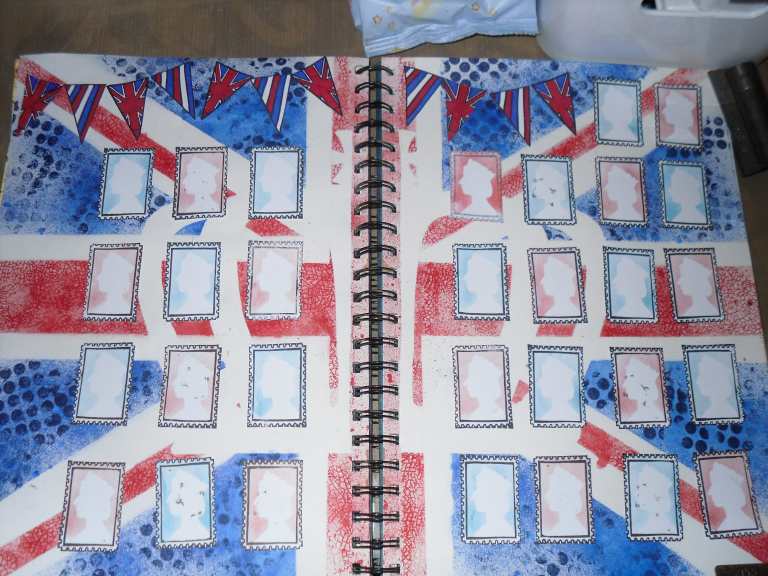 I masked out the Union flag using Dylusions sprays and Tim Holtz distress inks to colour in the blue/red bits. I also masked out a crown at the same time which I later coloured in with yellow Inktense pencil so that it showed up. The day stamps were made using a stamp of a Stamp from Pink Paislee – Daily Junque by masking out the bicycle in the middle and cutting them all out. Then I drew a silhouette of the Queen’s head and put barn door and chipped sapphire distress inks on using an ink blending tool and voila! Stamps!! Then I made bunting using the free Stamposaurus stamp from June Craft Stamper and sewed it together with my sewing machine. The ‘June 2012’ words were drawn on a Tube map my friend Alice picked up for me with Sharpies and then it was all stuck together. 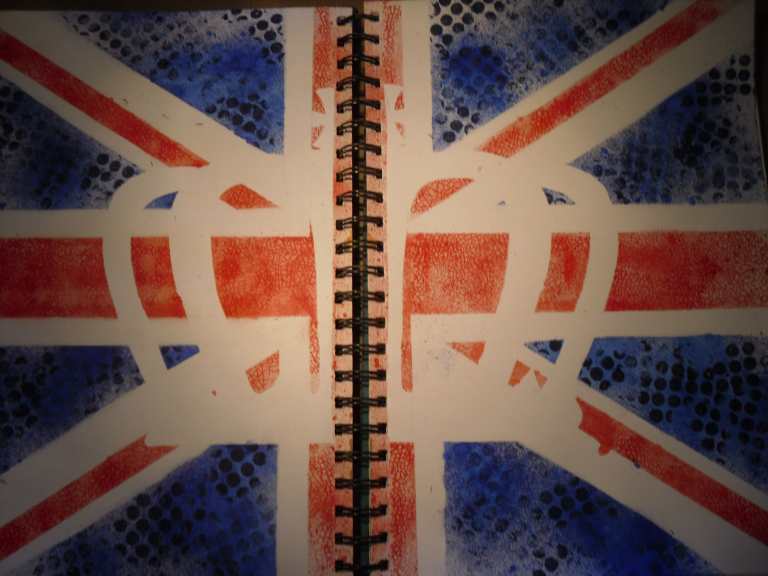 I think it worked out quite well, I just need to get on with filling it in!! 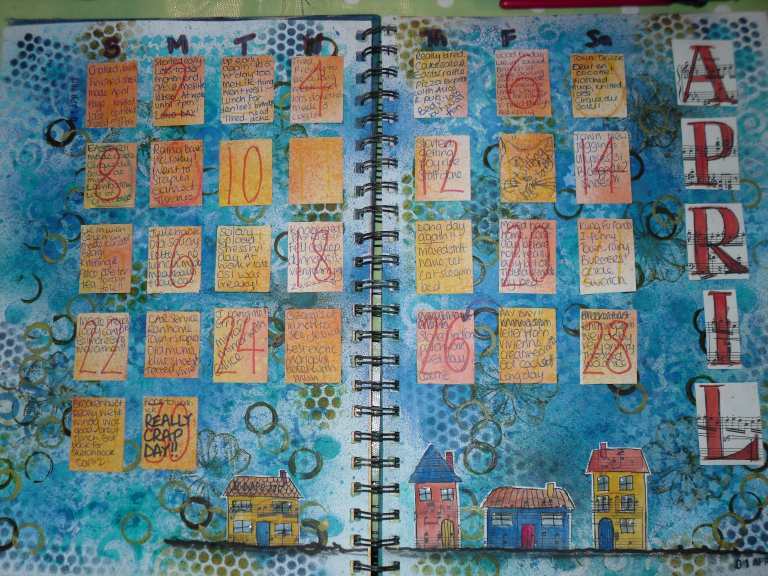 This is my May 2012 calendar challenge page done, I only did it this weekend so it’s definitely late. I’m not having a good time at the moment so I wasn’t feeling much like being creative. It’s Dylusions mustard paint (which isn’t available anymore) applied with a baby wipe, stamped with the Tim Holtz Papillon words and butterflies. 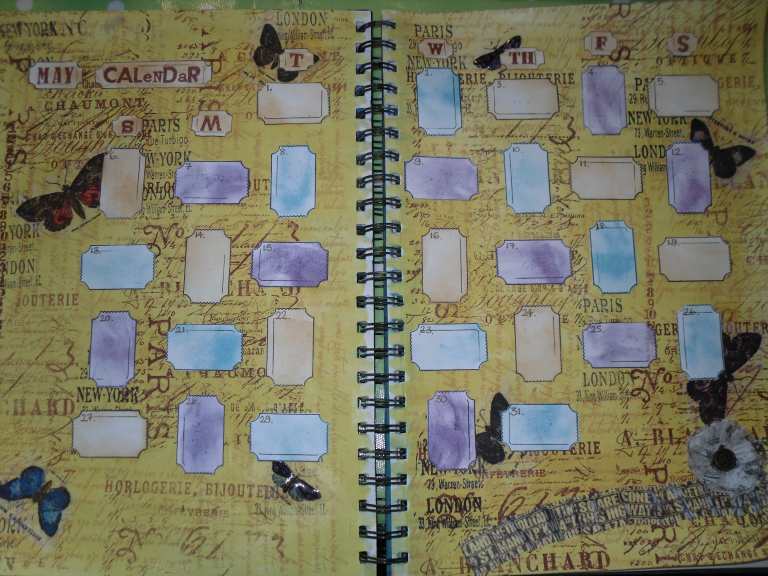 I made the days out of a papermania ticket stamp and coloured them with Distress Inks in Dusty Concord, Tea Stain and Shabby Shutters. 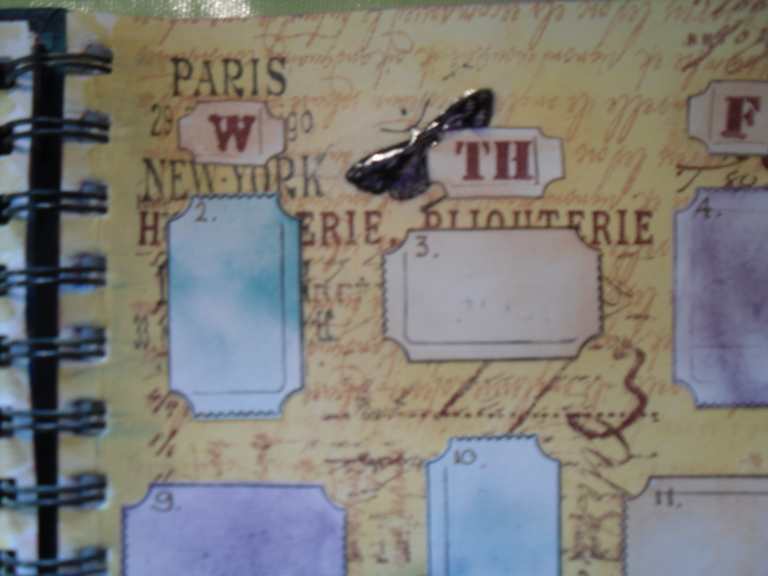 The butterflies were stamped on a tissue and adhered with matt medium and then coloured with Inktense pencils. I also added a tissue tape/button flower. It’s turned out OK considering it was a bit of a rush job without creative mojo. Close up of butterfly made 3D with glossy accents. I love the Papillon stamps I’ve already used them to decorate a blank MDF pen pot for my desk. I just hope that it improves during May but we’ll see. 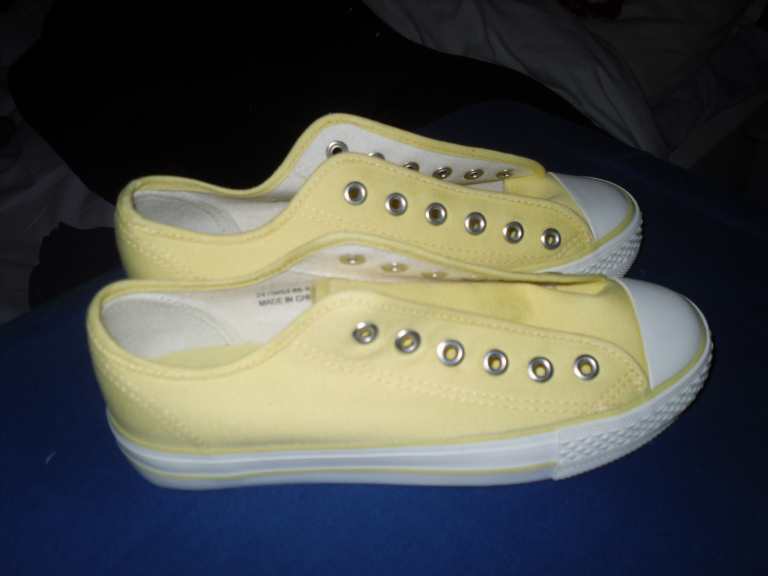 See these mild mannered yellow shoes (£9.99 in New Look) – well they became these!! I wanted a pair of orange Converse but couldn’t find any and was also a little bit reluctant to fork out another £40 for some as I’ve just treated myself to pair of green ones. (I have a bit of a thing for Converse!!). So when I found these yellow cheap ones I thought I’d get them and maybe embellish them with sewing or something to make them orange. Suddenly I had a light bulb moment – ping! and realised that I could paint and stamp them. So I did. I used Dylusions lemon yellow and satsuma sprays first. 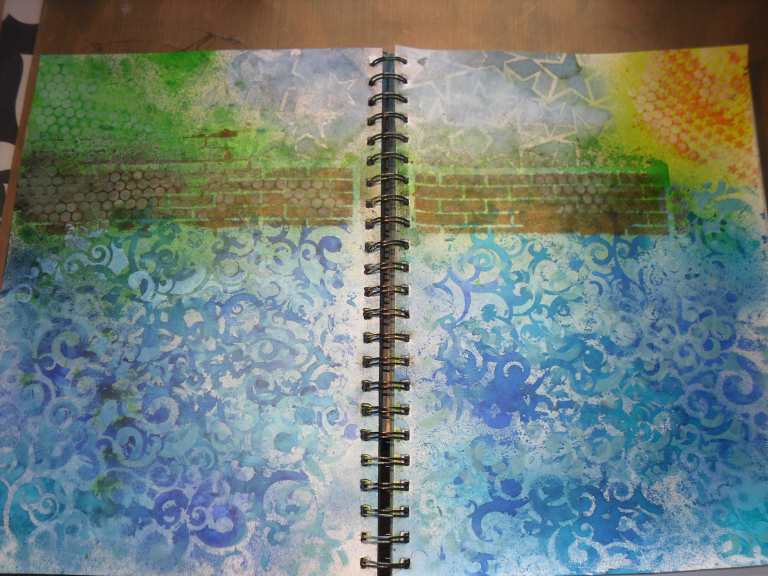 Then I sprayed a bit more through my Crafters Workshop swirl stencil and a dots/stars one. 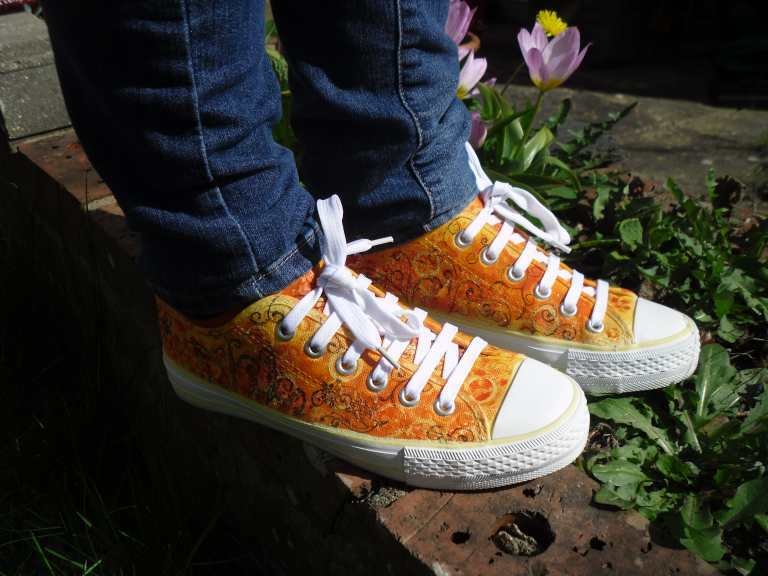 I then mixed a red and yellow fabric paint by Stewart Gill together to make two shades of orange that I stencilled through the stars and let it dry for a day. I also used a bottle top to put some mustard Dylusions acrylic paint in places. I stamped them with a flourish using Archival jet black ink and touched it up with a permanent marker. Finally I stencilled some Galactica artic Stewart Gill fabric paint through the stars again to give it a bit of twinkle. They are sprayed with scotchguard but to be honest I wouldn’t wear them in the wet anyway so they didn’t really need it. So what do you think?? My mum loves them and I now have a blue pair to make for her. 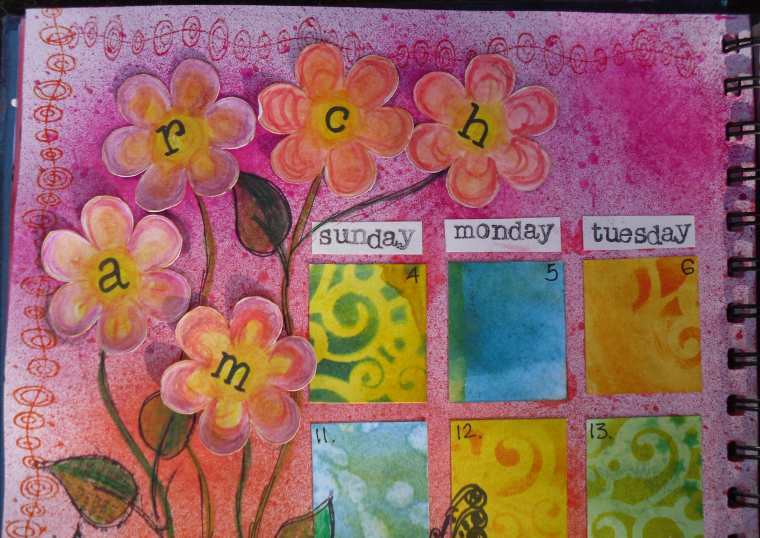 And as I’m stuck in blue/orange world this is my April calendar page for the 365 Calendar Challenge. The houses were drawn on music paper and painted with water colours and so were the letters for APRIL. The background is sprayed with Dylusions blue and turquoise ink and I tried to add some orange paint but it looks more like a muddy yellow to me. Detail of houses – I made the windows reflective by putting Glossy Accents on them. My March page is ready! I only finished it last night so I was a little late this month. It was a lovely way to de-stress after a week at work though, I must remember to do something creative/crafty on Friday evenings in future. The background was sprayed with Dylusions inks in lemon yellow, satsuma, poppy red and bubblegum pink (and I ended up with very messy hands after doing that!). 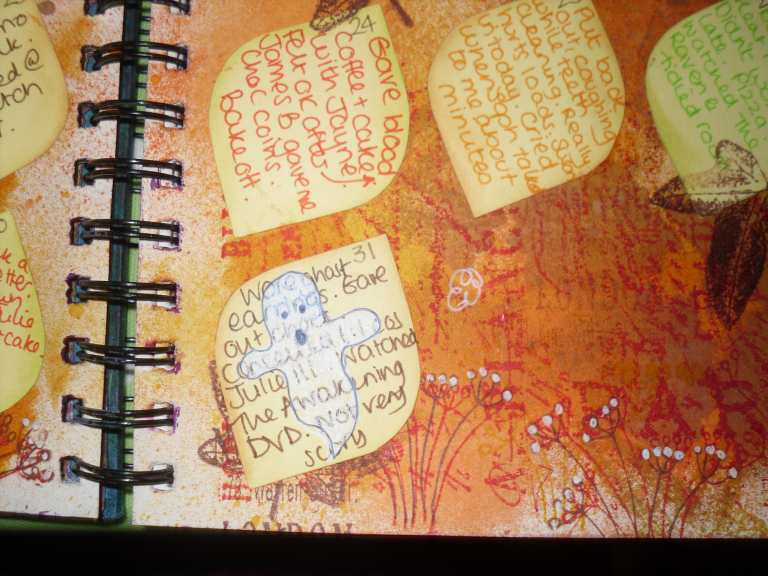 I then stamped the leaves from the Dylusions Around The Edge and coloured them in using my inktense penciles. I also stamped a sort of frondy grass stamp by Hero Arts in Dusty Concord, Broken China and Shabby Shutters Distress Inks all across the bottom. The other edges are stamped with another Hero Arts circly-wavy design with Spiced Marmalade and Worn Lipstick Distress Inks. 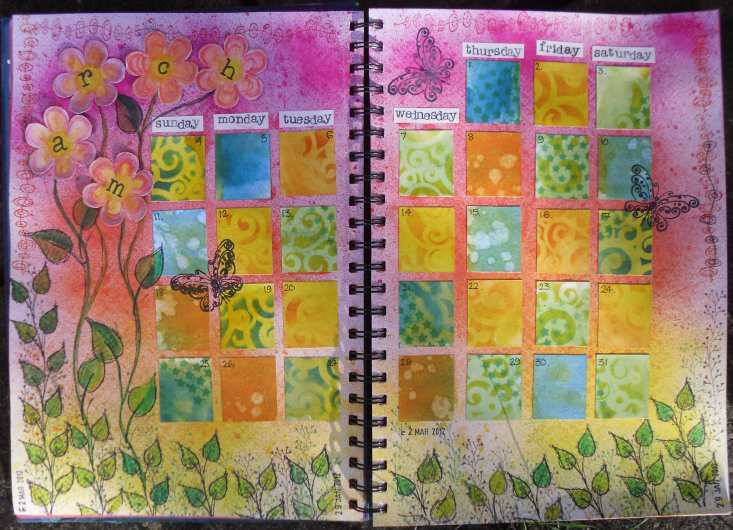 March was done using the free button flower stamp coloured with inktense pencils from Craft Stamper, only gluing them in the centres to make it a bit 3D. The stalks were inktense pencils with extra leaves from the Around The Edge set again. And the butterflies were another freebie from Craft Stamper. 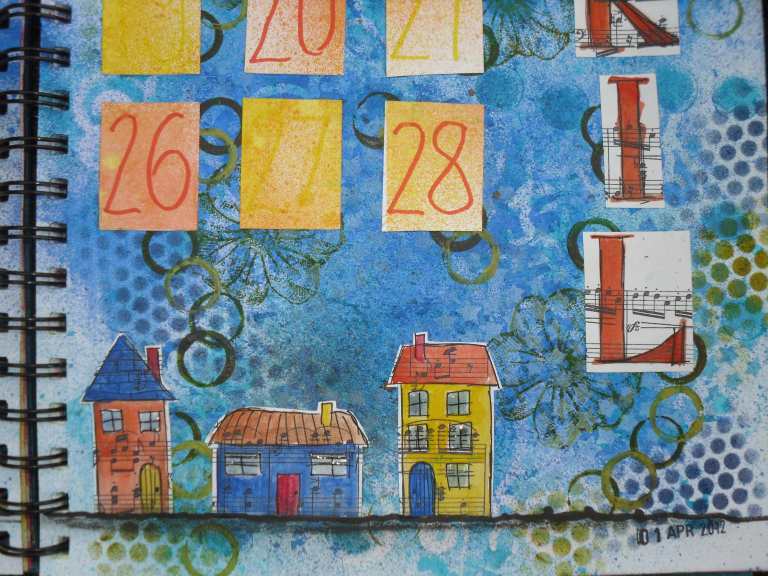 The days were done using a set of typewriter letter stamps and the day squares are all random distress inks and Crafters Workshop stencils experiment left overs! 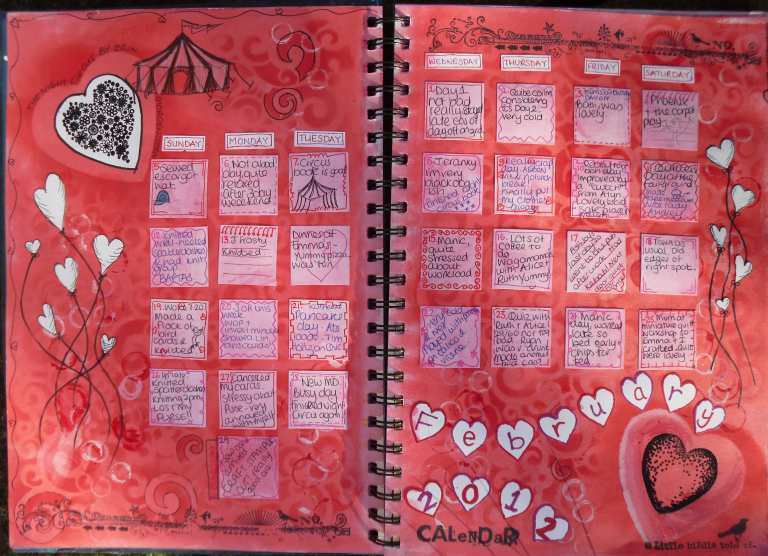 And here’s February all finished – the eagle-eyed may notice it has an extra circus tent now because I read The Night Circus by Erin Morgenstern twice this month and loved it so much that it sneaked onto my journal. Also, the circus is black and white with a hint of red so it fitted with my colour scheme. I just love the descriptions in the book of the clothes, the circus and the wonderful Wunschtraum clock. It’s difficult to explain what it’s about without spoiling it but I really enjoyed it. (P.S. It’s not out in paperback yet so I borrowed the hardback from my local library). And here’s a close up of my March flowers.